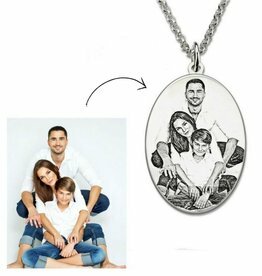 Convert children's drawings or photo to a jewel? And that for a great price? This can be done at KAYA jewelry. How does it work? Make your most beautiful memories in a jewel. Think of a child's drawing , grandma's signature or a picture with your loved one . A unique and precious jewelery, with a memory that will cherish you forever. Made of door-and-door silver, forever beautiful! 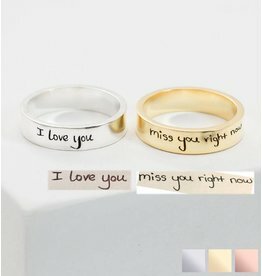 Bear your loved ones close to you by capturing their handwriting in a piece of jewelry. We can process signatures, small words and even a heart rhythm for you in a chain. A beautiful piece of jewelry, with a special meaning! Let your most beautiful photo capture in this beautiful key chain. 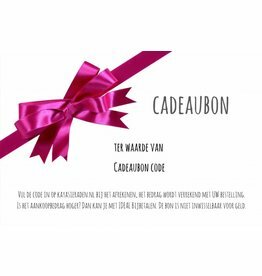 Choose from three models, beautiful gift for dad, mom or best friend! 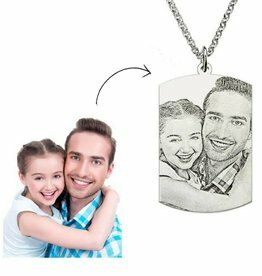 A unique way to carry your favorite memory forever with you. Let your most beautiful photo capture in this beautiful circular shaped necklace. 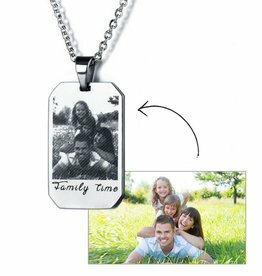 A unique way to carry your favorite memory forever with you. The necklace is made of stainless steel and has a place for a rear seat. Make your most precious photo capture in this beautiful heart-shaped necklace. 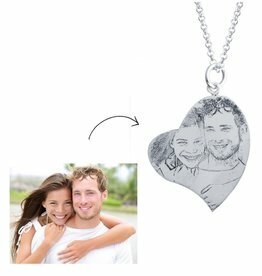 A unique way to carry your favorite memory forever with you. The necklace is made of stainless steel and has a place for a rear seat. Photo jewelry gives you the chance to wear someone as close as you can. Change your favorite photo to a jewel so you always carry the picture and memory. The photo chains we offer in different price ranges, so that there is something suitable for everyone. We use stainless steel (for a stronger look) or 925 sterling silver, forever beautiful. 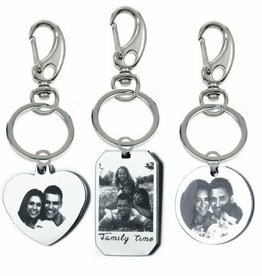 If you do not like chains, then a photo keychain is a good alternative and also a nice gift for the dads! Wat a fun idea! Take a drawing of your child and make it a piece of jewelry. You send a children's drawing and KAYA jewelry makes it a jewelery made for real-time silver. Tanja from KAYA jewelry says "Full fantasy and sweet touches draw my own children. As a result, the idea is to pour this into real silver. What proud mother does not like this now? Each piece of jewelry is unique and is made especially for you by means of the drawing you provide. "KAYA offers the ability to convert a children's drawing into a beautiful piece of jewelry that you will undoubtedly carry. When converting children's drawing, KAYA returns as much details as possible. Only sometimes we leave details away (like thin lines) because it becomes too vulnerable. The original character of the drawing will of course be retained as much as possible. 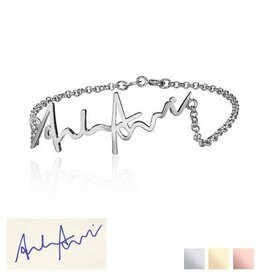 A beautiful way to wear a loved one forever is by showing his or her signature in a necklace or bracelet. A very personal piece of jewelry, with a sentimental meaning. For example, choose a piece of text from your grandfather, or go for the beautiful signature of Grandma so that they are close to you forever!